Some important things to know about the soundtrack for director Stephen Frear’s (The Queen, High Fidelity) film Tamara Drewe (based on a graphic novel of the same name by Posy Simmond), which saw a limited release in the U.S. earlier this month. 1. Composer Alexandre Desplat is a thrice Oscar nominated (The Queen, The Curious Case of Benjamin Button, Fantastic Mr. Fox) French composer who has scored over 100 films in his career. 2. This is the third time that director Frears and composer Desplat have worked together – the previous films being The Queen and Cheri. 3. The music is performed by The London Symphony Orchestra and led by Carmine Lauri. This means that the music is expertly performed and notes are ever-so-carefully played. Tracks like “Dogs and Cows” – with its powerful opening that leads into barely contained energy behind a few quietly played instruments – capture the seemingly effortless buoyancy this orchestra can push out. 4. There’s a track called “Biggest Shagging” – despite it’s catchy title (or maybe because of it) – it seems to most capture the main thematics of the rest of the score with its fast-paced, upbeat and consistently mysterious rhythms. Nothing in it seems to scream “shagging” aside from perhaps the slowly rising action that builds in the first half of the track (though it never seems to reach a climax – it just trails off and then repeats itself). Most of this track is repeated in the later “Where Are You Now?” If you want to get a good idea of what this score sounds like, take a listen to this track. 5. The band Swipe, which has two tracks on the soundtrack, was a band created for the film with songs written specifically for the film. Their music is rather nonsensical and not particularly enjoyable. It could have been left off – to the benefit of the album. 6. 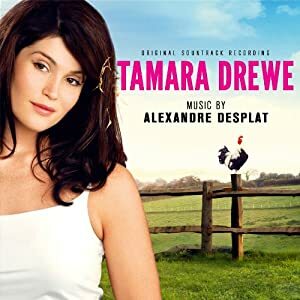 You can purchase the soundtrack for Tamara Drewe at Amazon , among other places. 1 user commented in " Music Review: Tamara Drewe Original Soundtrack Recording, by Alexandre Desplat "